RVs & Park Trailers – RADCO, Inc.
RADCO is proud to be a long time supporter and supplier of professional technical services to the Recreational Vehicle (RV) and Recreational Park Trailer (RPT) Industries. 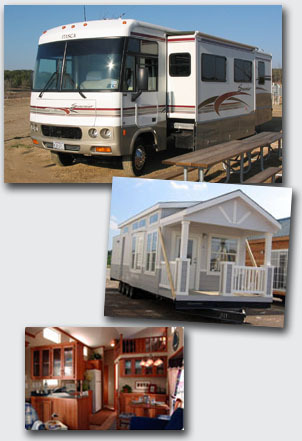 Nationally recognized as a design review and inspection agency for all types of factory built structures, RADCO is fully approved by all third party RV and RPT code states. RADCO supports the RVIA and is fully approved as a third party inspection agency for RPT. RADCO also offers a design submittal CAD drafting service for all code within the states and Canada. Our experts have first hand knowledge of the requirements in all locations. (Not available if RADCO provides state recognized third party design review for your facility). NFPA National Electrical Code Panel 19, which writes NEC Articles 551 Recreational Vehicles and Recreational Vehicle Parks and NEC Article 552 Park Trailers. ANSI A119.5 Recreational Park Trailers. ANSI A119.2 / NFPA 501C Recreational Vehicles. ANSI / RVIA EGS-1 Engine Generator Sets.